We have a diverse repertoire fitting many occasions, and we're ready to entertain audiences big and small. Our chorus can tailor a performance to meet your needs. Performance packages consist of a variety of music including country, jazz, rock, patriotic and ballads. Performance times can be adjusted to fit your specific program needs. Quartets from within the chorus may perform as part of the "show package." Fees: The fees for our performances vary and can be discussed by contacting the chorus performance coordinator, Carol Ogle, at [email protected] or (318) 348 2291. We love to sing gospel and can present a program of inspiring gospel and patriotic music for your church event. Our chorus or one of our quartets would be happy to sing the National Anthem at your upcoming game. Allow our chorus or one of our quartets to honor you with a serenade at your wedding. If you love Piney Hills Harmony Chorus and want to see this amazing group of women thrive, we'd like to invite you to become a sponsor. The additional income helps us reach out to new young talent in our community. Please contact us if you'd like to join forces. Piney Hills Harmony Chorus is affiliated with Sweet Adelines International, a 501(c)3 non-profit educational organization based in Tulsa, Oklahoma. Gifts are tax deductible to the extent allowed by law; please check with your tax advisor concerning the tax deductability of your gift. 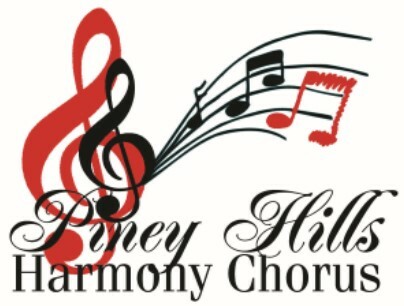 Piney Hills Harmony is a chapter of Sweet Adelines International, a non-profit organization of approximately 25,000 members in choruses and quartets worldwide. The Headquarters is in Tulsa, Oklahoma. Copyright © 2018 - Piney Hills Chorus.